You had an ACL reconstruction. And now you have a swollen knee. Your knee, after an ACL surgery will feel like it doesn't even belong to you. It will feel foreign, and it will be frustrating. Knowing what to expect before surgery will better prepare you for after surgery. Read on to find out about some of the things you will experience after acl surgery. I wish I could tell you that it wasn't painful. I would be lying. ACL reconstruction, whether with a patellar tendon graft, hamstring graft, or other donor tissue is painful. With my patients I use a scale of 0-10 to rate pain levels. 0 is no pain at all, and 10 is the worst pain ever felt in your life. On average, my patients rate their pain, 4-5 days after surgery when they come in, at a 6 or 7 out of 10. So, in general, ACL reconstructions have a moderate pain level. Pain is a very subjective thing, and will vary from person to person. Your physician should provide you with pain medications to help control your pain levels, and you may have a pain pump catheter as well. Pain levels are usually at their worst two days after surgery after the anesthesia is out of the body. It gradually decreases over the next several weeks, with the first week usually the worst. Is it Really My Leg? Probably the wierdest and most frustrating part of the post ACL reconstruction period is the fact that your quadriceps muscle just won't work. You try to contract it as hard as you can, and it just doesn't listen. Not even a flicker of contraction. This is completely normal. Frustrating, but normal. You will also notice that when you compare your surgery leg with your other leg, the surgery leg looks smaller. So why does the quadriceps seem to shrink, and won't respond to your contraction attempts? Its all about the swelling. When the joint swells, the capsule becomes distended and stretched. Your body's first reaction is to try to protect the knee. So, it turns the quadriceps off...just like flipping a switch. 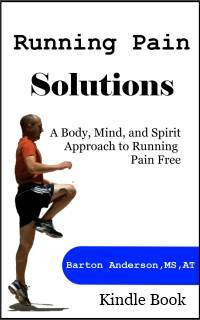 When your body turns off the quadriceps, you lose the ability to contract it. So, it just sits there, unresponsive. It also loses its normal muscle tone. Muscle tone is what gives our muscles shape. It is a constant small amount of contraction within the muscles. Your non surgery leg still has its normal tone, so it appears bigger. You will notice an area of numbness along the outside of the knee. This is especially true if you have a patellar tendon graft ACL reconstruction. This numb area varies in size from person to person. The small nerve that supplies sensation to the skin on the outside of the knee runs right across the front of the knee. 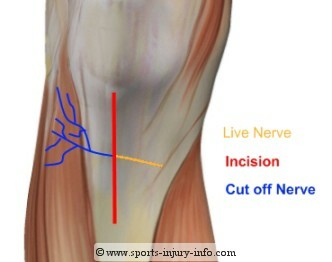 Unfortunately, they must cut through this superficial nerve to get to the patellar tendon. Which results in numbness on the outside of the knee. This area will shrink in size over time, but you will always have a small area of numbness or altered sensation. It is very common to have bruising around the knee and leg. As the bleeding from the surgery moves to the surface, it becomes visible. Gravity will pull some of this fluid down the leg, and you may have areas of discoloration in the shin or even in the ankle. Just because there is discoloration doesn't mean there is damage there. It is just where the blood ends up. Most surgeries require a signficant amount of sterile preparation before any cuts are made. Betadine, or other types of anesceptic scrubs are used up and down the leg to make sure that the area is very clean and sterile. Betadine, or the yellow discoloration that you see all over your leg after surgery doesn't come off easily with simple soap and water. The secret is to use rubbing alcohol to get rid of it. You may still have to scrub a little, but it will come off. The list above is not comprehensive, but it covers the most common questions I hear after ACL reconstructions. If you have other questions, please feel free to use the contact button on the upper left to send me your questions.